Peter Burns shares picture books with young children and models techniques for reading stories aloud during Dads’ Night at the Family Room. The drop-in evening program has been offered for over 25 years and is open to any father with children under eight years old. Every Dads’ Night includes a free dinner and activities, such as story time with Peter Burns. 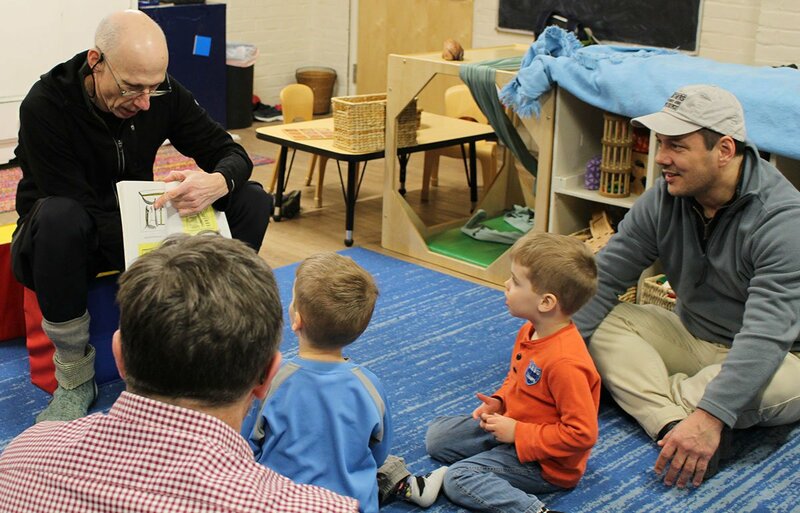 Peter’s visits to Dads’ Night are supported by Vermont Humanities via our Read with Me program, in which facilitators share the importance and the joy of reading picture books with young children. Learn how to host a Read with Me program of two to three sessions at your nonprofit organization. In addition, staff at the Family Room have appreciated how the books chosen by Vermont Humanities help teach emotional intelligence to both young children and their caregivers.